Any European Parliament elections will be bitter, divisive and fraught. But Remainers will have to campaign with all they've got. Let’s be honest: few but the geekiest among us has been genuinely excited by European Parliament elections in the past. That may be about to change. Theresa May has written to European Council president Donald Tusk again requesting a Brexit extension – this time to the end of June. Tusk is likely to counter by offering a ‘flexible’ 12 month extension (the horrendously named ‘flextension’). But whichever of the two options goes ahead, our participation in European Parliament elections this May is becoming inevitable. Parties are getting prepared now. On Thursday, LabourList reported that Labour has ramped up preparations for European parliamentary elections, by agreeing a process for selecting its MEP candidates. The Green Party will be announcing their candidates in the next couple of weeks, with some regions having already declared their lists. The Lib Dems are already effectively in campaigning mode. The SNP (2 MEPs) and Plaid Cymru (1) will be keen to capitalise on a Remainer surge. . .
Parliament opposes no deal (as demonstrated in the rapid passage of Yvette Cooper’s bill on Wednesday in the Commons). Even Theresa May is reported to have spoken out against no deal in her discussion with Corbyn. So short of May and Corbyn coming to a very rapid agreement – and getting it signed off by the EU in the next week – an extension is now essential to stop a no-deal Brexit happening. The UK government has accepted that any extension past May 22nd requires us to take part in European Parliament elections (indeed, the Electoral Commission is already preparing, as it must). The campaign starts, well, ages ago. And while we love to obsess over process here, the message Remainers put forward in any EP elections could dramatically shape this country’s future. In lieu of a General Election, EP elections will be thelitmus test of where public opinion now stands on Brexit. EP elections have never really been taken seriously in the UK. They have been a mid-term protest opportunity for the most disgruntled core of voters. UKIP came first in 2014. While the party is now falling apart, both they and Farage’s new Brexit Party will do all they can to capitalise on a feeling of ‘elite betrayal’. Make no mistake, they’ll be planning now, too. 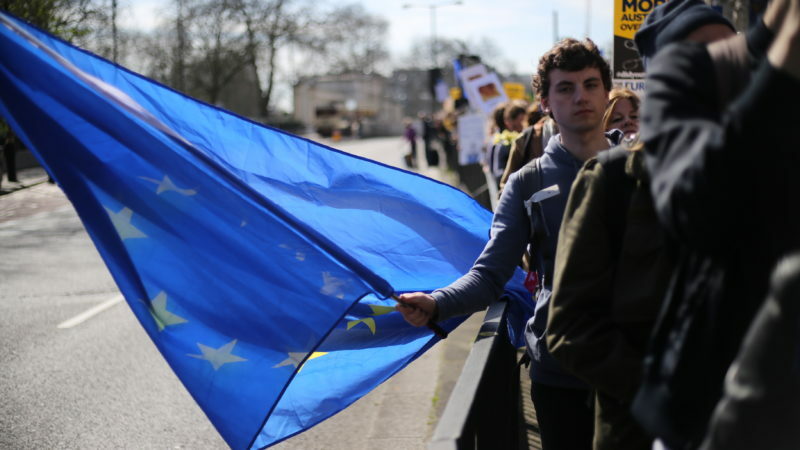 Among many conundrums faced by Remainers is this: many pro-EU Brits only became proudly pro-European after the referendum. We took our membership for granted. Visit nearly any other Europeam country and you find EU flags flown with pride. Yet in the UK we realised our European identity too late. Perhaps, though, it’s not too late after all. Recent demonstrations have shown a new passion has been ignited: a British-European identity that was muted before. European elections will be nasty, divisive, fraught. But they are also a chance for Remainers to fly the EU flag with pride. Indeed, to be on the front foot for the first time in a long time. I’m British and European – and there are millions who feel the same. It may be time for us to show it. I entirely agree with your view on this. As soon as I heard today (5/4/19) that preparations were to be made to organise European elections that in the absence of a People’s vote or a GE, that the European elections will be treated as a ‘referendum’ by whichever side gets the biggest vote. As you said, in previous European elections turnout has been very low and that UKIP took advantage of this to get a platform and wads of cash. Those of us who voted Remain really have to get out in great numbers to vote. Without doubt the Leave campaign with the assistance of the bulk of the media will be making similar exhortations to their supporters. I am, however, concerned about candidate selection. Changes to Tory membership, probably means most candidates will be Leave inclined. I worry, too, whether Labour will choose sufficient pro European candidates. The system is subject to tactical voting but, this is likely to affect oth sides of the argument, with Tory remainders voting for Labour candidates, if the Tory is Eurosceptic and vice versa. I think we are going to have, for the first time a serious and probably nasty and mendacious campaign, with a pretty big turnout. I voted to Remain in 2016 and would do so again but that is because of my conviction that the EU – warts and all – is the best way forward for this country. But if we have a second vote and people still vote to leave, so be it. I will learn to live with that. But please, don’t make us look like hooligans by trying to disrupt someone else’s party. Bad enough that we saw Nigel Farage pocketing his salary and jeering and insulting other MEPs. If you don’t want us to be there, fine. Don’t vote. Just leave our MEPS to sit respectfully in the European Parliament until such time as the British people decide again to leave. But please don’t bring our country into disrepute by merely seeking to cause trouble in Europe. We’re not children. Let’s leave with dignity. I get peeved about all this talk of democracy when it was Cameron & the Tories that fearing the Ukip & anti-EU Tory Parliamentary Party decided on a whim to overturn the democratic vote taken in the ’70’s to join Europe. And in which I campaigned for a NO vote, however, I lost that argument but willingly accepted that result. Now there is a dark force of ultra-nationalism abroad in this country and I genuinely fear for the future. Socialism is an international movement and must remain so regardless of race, colour, gender or borders. I sympathise very, very much with those who voted to leave based on for example lack of jobs (or at least “real jobs”), no real voice, underinvestment in midlands & the north etc., however please understand that Leavers are playing straight into the hands of the chancers and those with big money and property (https://www.theguardian.com/inequality/2017/sep/10/how-to-tackle-the-power-of-the-aristocracy). Why are the tory party extreme right so desperate to Brexit? – it’s obvious, stop playing into their hands. The EU supports social principles which the UK so desperately needs, employment safeguards etc which the US – Brexit will take us towards the US – so much despises. Say “No” to petty entrepreneurism, no contract jobs, selling off our NHS to the Americans (with the tory few profiting by), lack of investment in UK industry. It’ll be hard work but let’s start thinking collectively again as our proud forefathers did when they built a great country.